Galahad Books. Hardcover. 0883658534 New Condition *** Right Off the Shelf | Ships within 2 Business Days ~~~ Customer Service Is Our Top Priority! - Thank you for LOOKING :-) . New. BBS Publishing Corporation, 2000-09-01. Hardcover. Used:Good. Galahad Books. Hardcover. 0883658534 New Condition. . New. Galahad Books. Hardcover. 0883652439 Book is like new. Dust jacket in mylar protective cover has light shelf wear. . Fine. Grand Rapids: Wm. B. Eerdmans Publishing Company, 1960, 1960. Hard Cover. Nearfine/Nearfine. Stated First Printing. Very nice save for some very light wear, note that a dollar price and initials are written in ink on top right corner of half-title page. Also one small spot at bottom of the spine of the DJ. Book is very nice with illus endpages, 7 text illustrations plus wraparound jacket illustration.. Hardcover. Grand Rapids: Wm. B. Eerdmans Publishing. Very Good in Very Good dust jacket; Internally clean with spotted edges. . Jacket clipped and edgeworn, mostly at spine; protected in mylar cover. . Laid in is a B&W photo of the Carl D. Bradley, a ship famously lost when . it sank in Lake Michigan. The Bradley is shown on the front endpaper.. 1960. First Edition. Hardcover. 0802870104 . Grand Rapids, MI: William D. Eerdmans, 1960. From the library of Columbia College author/scholars and Story Workshop creators John Schultz and Betty Shiflett. A clean, unclipped and unmarked copy with mild rubbing to spine corners of jacket, protected by the plastic cover.. First Edition. Hard Cover. Fine/Near Fine. Illus. by Photographs. Octavo. Galahad Books. Hardcover. 0883658534 Like New Condition. . Fine. Galahad Books. Hardcover. 0883652439 Like New Condition. . Fine. Wm. B. Eerdmans Publishing Company. Used - Good. Ships from the UK. Former Library book. Shows some signs of wear, and may have some markings on the inside. 100% Money Back Guarantee. Your purchase also supports literacy charities. Galahad Books, 1994-04-01. Hardcover. Like New. Like new hardcover with dust jacket. Pages are clean and unmarked. Dust jacket shows minor shelf wear. ; 100% Satisfaction Guaranteed! Ships same or next business day! Grand Rapids: Eerdmans, 1960 Near fine/very good (minor DJ corner wear). Brodart added. first issue edition. Binding is cloth..
Wm. B. Eerdmans Publishing Company. Very Good in Good dust jacket. 1960. 1st prtg. Hardcover. Owner nameAll dust jackets are in Mylar acid-free protectors. .
Grand Rapids, Michigan: Eerdmans Publishing Co., 1960. Stated First Printing. Hardcover. Very Good/Very Good+. Reynold H. Weidenaar, Illustrator. First Edition, First Printing, in original jacket. White cloth boards with black lettering on spine. Hint of foxing to boards, otherwise clean. No fraying or wear. Binding is tight & square, no cracking. Pages and edges are clean. Beautifully illustrated endpapers, with very small previous owner label on front fixed endpaper. 298 pgs. with index. Black & white illustrations and maps. Clean dustjacket is price clipped at upper corner of front inside flap, has slight wear at top spine edge. Enclosed in new archival quality removable mylar cover. The most spectacular shipwrecks and incredible survivals in the history of the Great Lakes, with beautiful illustrations by Reynold H. Weidenaar. William B. Eerdmans Publishing. PAPERBACK. 0802870104 Special order direct from the distributor . New. Grand Rapids, Michigan, U.S.A.: Eerdmans Pub Co, 1986. Reprint Edition . Paperback. Fine/No Jacket. 8vo - over 7¾" - 9¾" tall. Reynold H. Weidenaar. ILLUSTRATIONS, 2 PAGE MAP OF GREAT LAKES SHIPWRECKS, Fine blue pictorial trade paperback. (1986), 8vo, , 6-384pp. Great Lakes Shipwrecks and Survivals. Galahad Books., 1994. First Edition.. Hardcover.. 9 1/4 x 6 1/4 x 1 3/8.. NON SMOKING STORE. My listing includes PHOTO OF ACTUAL BOOK for sale. Book NEVER READ. GIFT QUALITY. Book AS NEW, Dust Jacket Very Fine. Black/white sketches. Grand Rapids, Michigan, U.S.A.: Wm. B. Eerdmans Publishing Co., 1981. Very large, sturdy softcover, stunning color-illustration of ship amid gigantic waves on front, spine and back wrappers, 384 lightly browned pages plus a final illustration by Weidenaar. Light wear to top front edge, slight surface wear and crease at bottom front tip, very slight wear to bottom front edge and spine bottom right edge, slight wear at spine top edge and long spine edges. Near Very Good.. Soft Cover. Very Good. Illus. by Weidenaar, Reynold H..
New York, NY: W.B. Eerdmans Publishing Co., 1960. X3 - DJ has light shelfwear on bottom & small wrinkle on top near gutter, book has sticker marking on front loose end paper & previous owner's ex-library embossing. DJ is mylar protected. William Ratigan Knows the Great Lakes with the intimacy of personal association as well as detailed scholarship. He has caught the drama and heroism of the long ships, and the exacting hazards of sailing them.. First Edition. Hard Cover. Very Good/Very Good. Illus. by William B. Eerdmans. 8vo - over 7¾" - 9¾" tall. Grand Rapids, Michigan: WM. B. Eerdmans Publishing Company, 1960. X3 - DJ has 1/4 sealed tear on top front. Also chipping on top of spine. Wear along gutter. Also 1'' x 1/4 '' stain on back. DJ is mylar protected. Book has light shelfwear & ''963'' written neatly in ink on front loose end paper, hard to see. Illustrated end papers. William Ratigan knows the Great Lakes with the intimacy of personal association as well as detailed scholarship. He has caught the drama and heroism of the long ships, and the exacting hazards of sailing them.. First Edition. Hard Cover. Very Good/Good. Illus. by Reynold H. Weidenaar. 8vo - over 7¾" - 9¾" tall. Wm. B. Eerdmans Publishing. Hardcover. A very nice book from Private Collection. Book is clean, tight & square. Book and Dust Jacket show only typical, used wear. DJ has some shelf wear and minor chips or fraying, small tears. A VERY nice copy overall. NOT Remainder, NOT Ex-Library. New Mylar Cover. First Edition. . Very Good. 1960. First Edition. Grand Rapids, Mi: Eerdmans, 1960, First printing. Octavo, hardcover, first edition, VG in white boards. No dj. 298 pp plus endpapers illus by Weidenaar. Endpapers show heavy seas and the death of the CARL D. BRADLEY, Tuesday. Nov. 18, 1958.. Very Good/No Jacket. New York, NY: Galahad Books, 1974. Price-clipped, smal teart back of DJ. owners inscription. Buy with Confidence from a FABA (Florida Antiquarian Bookseller Association) Member - for more than quarter of a century.. First Edition. Blue Boards. Very Good/Good. Illus. by Line Drawings. 8vo - over 7¾" - 9¾". Hardback. Grand Rapids, Michigan, U.S.A.: Wm. B. Eerdmans Publishing Co., 1983. Originally published, 1960. Very large, sturdy softcover, glossy color-illustration of ship caught amid huge waves on front, spine and back wrapper, 384 lightly browned pages plus final illustration of waves, illustrations throughout. Very slight surface wear to most edges. Very Good.. Soft Cover. Very Good. Grand Rapids, Michigan, U.S.A.: Eerdmans Pub Co, 1978. Book. Illus. by Weidenaar, Reynold H.. Very Good. Trade Paperback. 8vo - over 7¾" - 9¾" tall. Very-good, clean condition. Stated Third Printing, Third Edition. NO remainder marks or clippings. Covers show light wear (NO tears). Illustrated. NO writing or tears inside book. Tight spine, clean pages. 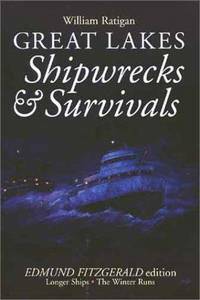 In this breathtaking chronicle of the most spectacular shipwrecks and survivals on the Great Lakes, William Ratigan re-creates vivid scenes of high courage and screaming panic from which no reader can turn away. Included in this striking catalog of catastrophes and Flying Dutchmen are the magnificent excursion liner Eastland, which capsized at her pier in the Chicago River, drowning 835 people within clutching distance of busy downtown streets; the shipwrecked steel freighter Mataafa, which dumped its crew into freezing waters while the snowbound town of Duluth looked on; the dark Sunday in November 1913 when Lake Huron swallowed eight long ships without a man surviving to tell the tale; and the bitter November of 1958 when the Bradley went down in Lake Michigan during one of the greatest killer storms on the freshwater seas. An entire section is dedicated to the wreck of the Edmund Fitzgerald -- the most famous maritime loss in modern times -- in Lake Superior in 1975. Chilling watercolor illustrations, photographs, maps, and news clippings accentuate Ratigan's compelling and dramatic storytelling. Sailors, historians, and general readers alike will be swept away by these unforgettable tales of tragedy and heroism. 8vo - over 7¾" - 9¾" tall. Wm. B. Eerdmans Publishing Company. Used - Good. Shows some signs of wear, and may have some markings on the inside. Wm. B. Eerdmans Publishing Company. Used - Like New. Ships from Reno, NV. Book in almost Brand New condition. 100% Money Back Guarantee. Shipped to over one million happy customers. Your purchase benefits world literacy! Grand Rapids, MI, U.S.A.: William B. Eerdmans Publishing Company, 1989 Paperback. very Good. BBS Publishing Corporation, 2000-09. Hardcover. Good. 1977. paperback. This is a listing from our open store stock. We will be happy to answer any questions about condition or other concerns . Eerdman's Publishing. 384 pages. Clean paperback. Great Lakes Shipwrecks and Survivals . Very Good. Soft cover. 1st Edition. 1989. Grand Rapids, MI, U.S.A.: William B. Eerdmans Publishing Company, 1989. Wraps have light wear. Pages are clean with no markings in text. . Soft Cover. Very Good. 8vo - 7¾" - 9¾" Tall. Galahad Books. Used - Good. Shows some signs of wear, and may have some markings on the inside.